Another massacre on Maria Island leaves me in despair. What is Tasmania doing to her wildlife? This is not a cull – a cull removes the weak and sick animals. This is an outright massacre of 600 beautiful native Australian animals, supposedly 'protected.' The people making this decision are government officials devoid of compassion for the individual animals so tragically destroyed and for the suffering of the people who love those animals. Governments lie saying their 'cull' was 'sustainable,’ 'humane' and necessary as the animals were 'overgrazing' or 'threatening endangered species.' Nothing humane about bludgeoning a joey to death which is the 'humane' code of conduct for killing kangaroos. Nothing true about overgrazing or threatening other species either. And why is there never a non-lethal alternative such as fertility control or relocation? Does it cost too much? Another lie. It cost the ACT government $500,000 to kill 514 kangaroos at Belconnen in 2008. Relocation by wildlife people would have been a fraction of the cost. Australia is at war with its wildlife. We have the world's record of species extinctions having driven 38% of our native species extinct in just 230 years. 2010 is the Year of Biodiversity. Isn't it time we changed out attitude and learned to live in harmony with wildlife? Farmers, please educate yourselves about the value of native animals to the ecosystem and find non-lethal ways of excluding them from your crops while providing wildlife corridors for them to traverse the land they have inhabitated for millions of years. Replace deadly barbed wire with single strand wire and everyone else please drive carefully on the roads at dawn and dusk. In the meantime I am cancelling my plans to visit Tasmania this year! We in Australia have such an ambivalent relationship with our unique and world-famous wildlife. They are feared as being over-abundant, as over-grazers and thus environmental threats, and except for the emu and kangaroo, are little known in their own country. Tasmania has a cruel and twisted history of human and animal abuse. The indigenous peoples were discarded and killed, and that's where the Tasmanian Tiger was exterminated. The level of suffering and human abuse in the Colonial era of penal settlements has left a dark pall over this jewel of an island. It is famous for environmental vandalism that still continues today, with Gunns and old-growth forests continually under threat, and that's where the Greens and TWS originated. BT Possums are processed for skins and meat as an export, and the atrocities of 1080 poison, to stop wildlife eating new growth is still being debated. Iconic Lake Peddar was flooded in Tasmania. 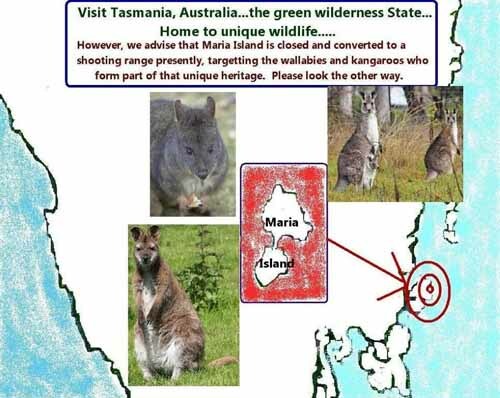 Tasmania's dark history is still evident today, with "culls" of native wildlife when there are non-lethal alternatives. Attitudes have little changed since Colonial days. Those culpable of wildlife slaughter on Tasmania's Maria Island are no doubt backward graduates of the psychopathic Martin Bryant School of Extinction. Those treating wildlife as vermin deserve a taste of their own 1080. Committing local extinction is a more despicable crime than mass murder. This comment presumes that Martin Bryant is guilty as charged of the horrific mass murder at Port Arthur in 1996. Yet there is strong evidence that he may be innocent of the crime. Initially he pleaded not guilty. Only months later, after this person of very low IQ was subject to huge pressures whilst in solitary confinement, did he plead guilty. He was never tried so the evidence against him was never tested in a court of law. Those who want to know of the case against Martin Bryant being the Port Arthur killer should read the article "The Port Arthur Massacre - Was Martin Bryant Framed?" parts 1, 2 & 3 (pdf 100K, 111K & 126K) by Carl Wernerhoff in Nexus1 magazine issue 77 of June-July 2006. (See also footnote in article "Was Martin Bryant the Port Arthur killer?" which I wrote in response to another piece which similarly damned Arthur Bryant. Comments which argue why these articles may be wrong are welcome. Welcome back James, to your contributions to CDB. However, I don't agree with you. Bryant had the weapon, a chip on his shoulder, and was actually seen committing the crime. Nobody else has been a suspect and there are some survivors. Why make something difficult when it seems to be a clear cut case? He had the smoking gun, and defendants are always told to plea "not guilty" to get a lesser charge. More court cases, more complications, more appeals, more mitigating circumstances drags out these issues further and thus the barristers and lawyers accumulate higher fees. I don't think you could have read the references James cited, Vivienne. In fact the descriptions of the gun-man did not match Bryant's and eye witnesses have actually called the entire investigation into doubt. Also, he did not ever get a trial, so no-one can say that the evidence was tested, as far as I can see. I have read some of the references cited by James and there seems to be severe doubt. I am hoping that someone who has nursed Bryant or has another kind of insider view may comment.